If you love science and enjoy learning, you're in for a treat! Andrew (the brains behind Mark2Cure) will be holding a webinar using two case studies (the Gene Wiki Project and Mark2Cure) to illustrate the use of crowdsourcing as it applies to knowledge management for translational research. Registration is free and open to anyone (we checked first). There may be some required questions on the registration form which may not necessarily be applicable to you, but they're only meant to inform, not exclude. So, if you're interested in the webinar but don't have an affiliation with an institute or department, feel free to select 'other' and type in 'Mark2Cure'. First, the goal of the Gene Wiki project is to create a community-maintained knowledge base of all relationships between biological entities, including genes, diseases, drugs, pathways, and variants. This project draws on the collective efforts of informatics researchers from a wide range of disciplines, including bioinformatics, cheminformatics, and medical informatics. Second, the Mark2Cure project partners with the citizen scientist community to extract structured content from biomedical abstracts with an emphasis on rare disease. Although citizen scientists do not have any specialized expertise, after receiving proper training, Mark2Cure has shown that in aggregate they perform bio-curation at an accuracy comparable to professional scientists. The Digital Scholar Webinar Series introduces health researchers at USC, CHLA and beyond to digital approaches and tools relevant to their research. The series showcases the potential and limitations of digital approaches health researchers need to be aware of. All webinars will be accessible afterward on the Digital Scholar Program page. We have been working on a preliminary analysis of the relationship extraction data generated by our fantastic Mark2Curators. This analysis is in the process of being written up into an academic paper and if your data was used for this paper, you will be given option of being credited on a page on our site dedicated to the contributors for this paper. We expect to have an email notifying contributors to the data set out by early next week, so keep an eye out for it. In case you missed it, September 21st is World Alzheimer’s day, and our friends at EyesOnAlz will be holding a world-wide Catchathon. Our very own TAdams organized a local team to participate in a previous Catchathon. If members of the Mark2Cure community are interested in teaming up and contributing with other Mark2Curators for this Catchathon, we would be happy to organize a Mark2Cure team for the event. Otherwise, if you are interested in contributing to Alzheimer’s research from the comfort of your own computer on an individual basis, we 100% encourage you to do so! If you’ve ever wished that there was a citizen science project for answering questions about how nutrition and other habits affect health and other outcomes—there’s now a new platform to address your questions. This platform, Galileo, comes from the Knight Lab at the University of California, San Diego—the same lab that is responsible for the American Gut project! Mark2Cure's 3rd anniversary is coming up, and we are extremely grateful for the opportunity to have interacted and learned from you over the last few years! You make this project interesting. You make this project interesting and exciting. You make this project educational and humbling. You make this project useful and valuable. Although our research team has shrunk two half of what it was when we first started, we have been able to continue to move forward only because of you! We cannot thank you enough! As a citizen science effort, Mark2Cure is primarily driven by volunteers--and volunteers like you have brought us to where we are today. As of today, we have over 1.3 million annotations!!! We are currently busy with the analysis, so please accept my apologies for being a bit more slow to respond to your inquiries. Fortunately, you and your fellow volunteers continue to help us move forward. In fact, we are excited to share a new preprint on aligning citizen science opportunities with the needs of students fulfilling community service and service learning requirements. The research on these requirements was primarily performed by a volunteer with a marketing/business background and was inspired by a few high school Mark2Curators who have been kind enough to share their experience and needs as students and volunteers. You can find the preprint on bioarxiv here, and it has been submitted for peer review in the journal Citizen Science Theory and Practice. A designer has also wrapped up her work on making Mark2Cure more intuitive and user-friendly. A huge thanks to those of you who took the time to provide feedback on individual parts of her designs--although your feedback may not necessarily be incorporated in them here, we will definitely take your detailed and valuable suggestions into consideration. Since this is citizen science and your voices are important--I'd like to share the designs with all of you. You can find the wire frames here. Note that the actual wording/content is subject to change (especially since we've received detailed content recommendations from some of you), and that the focus is more about the layout of the content. Please feel free to share your opinions about it with us! For those of you who have joined us in last year's #MedLitBlitz or this year's #CitSciMedBlitz, you may be familiar with our friends at Cochrane Crowd. Like Mark2Cure, Cochrane Crowd is a citizen science project where volunteers help inspect biomedical abstracts. Cochrane crowd was also launched in May and are celebrating their anniversary with the #showyourscreen 2 Million annotations challenge. Learn more about the challenge here. It's on! The CitSciMedblitz week of challenges have started! If you missed the webinar detailing the three biomedical/health citizen science research projects, it is available for viewing on youtube. With regards to the challenges, up first (and going on now!) is the EyesOnAlz 24hr Catchathon. EyesOnAlz is an Alzheimer disease-focused citizen science project investigating stalled blood in brain images. It has a lot of cool images/videos in need of review by citizen scientists and a lot of fun features. The challenge has only just started and will run to 7am PST (3pm GMT) tomorrow (Feb. 28th) so get in on it ASAP! 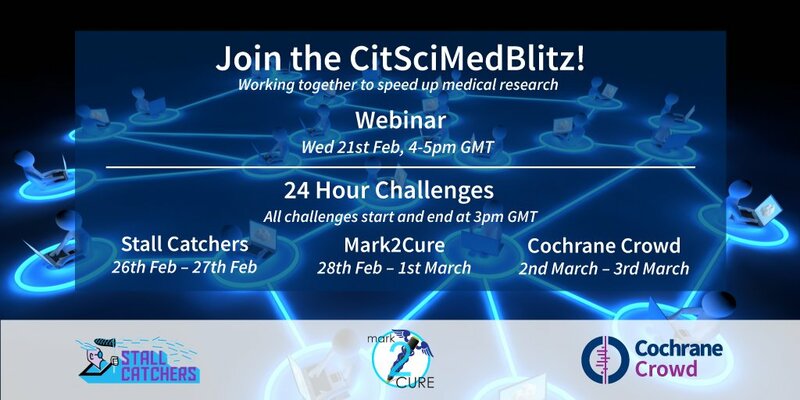 The Mark2Cure challenge will start at 7am PST (3pm GMT) on Wednesday, February 28th. It is a doubly-special day because the 28th is Rare Disease Day and we have had an incredibly inspirational weekend at the Sanford Burnham Presby Rare Disease Day Symposium. We look forward to sharing rare disease stories from Mark2Curators and bringing awareness about these diseases as we tackle the literature around NGLY1 during this 24hr challenge. Speaking of literature, our old friends at Cochrane Crowd are back with a lot of new features which you can explore during the Cochrane Screening Challenge. This challenge starts at 7am PST (3pm GMT) on Friday, March 2nd and runs for 24hrs. It's finally February which means it's time to prepare for Rare Disease Day 2018 and CitSciMedBlitz! This year's theme for Rare Disease Day continues off of last year's theme--research. According to RareDiseaseDay.org, patients are not only subjects but also proactive actors in research--and we couldn't agree more! Mark2Cure would not be where it is now without the inspiration, contributions, and drive from our partners and contributors in the rare disease community. Mark2Curators have inspired us with their generosity, perseverance, curiosity, and overall intellectual voraciousness--and for us, Rare Disease Day is an opportunity to share about the diseases that the Mark2Cure community cares about--and not just NGLY1-deficiency. If there is a disease that you care about that you'd like us to highlight for Rare Disease Day, please get in touch. Patients are not only subjects but also proactive actors in research. As citizen science becomes increasingly popular in biomedical research, patients and care providers are becoming increasingly important partners for disease research in general. And, as many of you have pointed out--we will all be patients at some point in our lives so it's nice to be able to actively contribute to disease research. 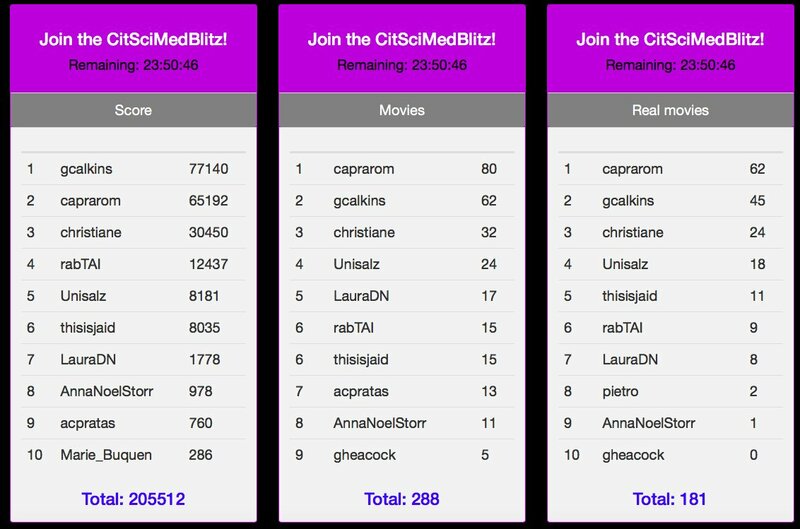 In addition to helping to organize the knowledge surrounding NGLY1-deficiency, patients and citizen scientists have been making important contributions to Alzheimer's disease research and contributing to health evidence--all of which brings us back to CitSciMed Blitz! Similar to last year's MedLitBlitz, there will be prizes for the top contributors to all THREE platforms. Only participation during the 24hr challenges will count towards the prize, however, you are welcome to register and complete the training for the other platforms prior to the event if you'd like. Learn more about the event and the other platforms here. In case you haven't heard, David Lipman and the GenBank team are in the running for the People's Choice Award of the Samuel J. Heyman Service to America Medals (#Sammies2017). Although Lipman and the GenBank team weren't featured in Medium.com or other news sources, they still made it to the final four. At this point, many of you may be wondering why we're even talking about Lipman and the GenBank team on a discussion venue meant for Mark2Cure. Mark2Cure is a citizen science project that deals in biomedical literature, and doesn't involve BLAST or Lipman or GenBank, right? But, when you think about how much of scientific progress is incremental, you begin to appreciate the impressive volume of preceding work. This is especially true if you work on a project like Mark2Cure. Mark2Cure aims to enable citizen scientists to help mine information from the biomedical literature, which means that Mark2Cure would NOT exist if there wasn't a massive volume of preceding and ongoing work in biomedical research. We've been able to build Mark2Cure because key information infrastructure was already in place--PubMed. Lipman launched PubMed in 1997 followed by PubMed Central in 2000. Without PubMed and the subsequent tools built for utilizing PubMed, identifying abstracts and pulling them into Mark2Cure would be more difficult. Interestingly enough, Lipman's and the GenBank's team nomination for the 2017 Sammies only cursorily mention PubMed Central in favor of focusing on GenBank and his contributions to infectious disease surveillance. Perhaps describing their work this way made it more accessible to anyone not in biomedical research. Unfortunately, their profile description doesn't adequately convey how important the infrastructure they've built is to modern biomedical research in the US, open science, and Mark2Cure. For members of our community who like science and like being able to read scientific articles: PubMed Central (PMC) has been a central repository for research articles that ANYONE can access and read. Thanks to NIH leadership, publications resulting from research supported by the NIH must be deposited to PMC. For members of our community who are afflicted or know someone who is afflicted by a rare genetic disorder: GenBank has been a central repository for DNA sequences and BLAST has been an important means of searching those sequences. Without a central repository for DNA sequences, it would be a lot more difficult for researchers to map and annotate functionality associated with those sequences, to draw comparisons on protein function across the different model organisms, and most importantly, to build on each other's work. Much of what we know (or will know) about rare disease genes or proteins comes from (or will come from) expanding on the work of researchers studying worms (or flies, mice, frogs, fish, and more) thanks to the knowledge sharing enabled by PubMed and GenBank. For the members of our community who just like to help: Mark2Cure exists because of the sheer volume of incremental progress that is represented by the publication of biomedical research articles. Incremental progress isn't as exciting or fun to talk about as scientific 'breakthroughs', but in science a lot of incremental progress had to happen in order for these 'breakthroughs' to follow. There is so much to sift through, and every contribution from our citizen scientists unlocks a bit more information buried in the text. The Mark2Cure dream is that in unlocking information from the text, you will be able to help with 'breakthroughs' in disease research. Although I've been rambling about the importance of Lipman and the GenBank team's work to modern biomedical research, Mark2Cure would be nothing without the community of citizen scientists that contribute to it. In no way should this discussion of Lipman and team detract from this fact.